Size of this preview: 423 × 599 pixels. Other resolutions: 424 × 600 pixels | 2,480 × 3,510 pixels. English: An example of how to create a set of study notes in a margin, using text taken from Leaf. Demonstrates the use of drawings, diagrams and colour in the creation of study notes. This is a retouched picture, which means that it has been digitally altered from its original version. Modifications: PNG version of the file.. 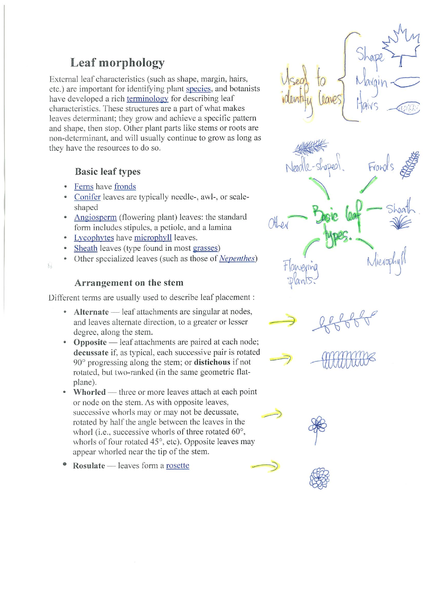 The original can be viewed here: Study notes example leaf morphology.pdf.